According to Colin Goldblatt, author of a paper published online in the 28 July 2013 issue of Nature Geoscience, “The runaway greenhouse may be much easier to initiate than previously thought.” Furthermore, as pointed out in the 1 August 2013 issue of Science, in the near term Earth’s climate will change orders of magnitude faster than at any time during the last 65 million years. Tack on, without the large and growing number of self-reinforcing feedback loops we’ve triggered recently, the 5 C rise in global-average temperature 55 million years ago during a span of 13 years, and it looks like trouble ahead for the wise ape. This conclusion ignores the long-lasting, incredibly powerful greenhouse gas discovered 9 December 2013 by University of Toronto researchers: Perfluorotributylamine (PFTBA) is 7,100 times more powerful than carbon dioxide as a greenhouse gas in the atmosphere, and it persists hundreds of years in the atmosphere. It also ignores the irreversible nature of climate change: Earth’s atmosphere will harbor, at minimum, the current warming potential of atmospheric carbon dioxide concentration for at least the next 1,000 years, as indicated in the 28 January 2009 issue of the Proceedings of the National Academy of Sciences. Finally, far too late, the New Yorker posits a relevant question on 5 November 2013: Is It Too Late to Prepare for Climate Change? Joining the too-little, too-late gang, the Geological Society of London points out on 10 December 2013 that Earth’s climate could be twice as sensitive to atmospheric carbon as previously believed. New Scientistpiles on in March 2014, pointing out that planetary warming is far more sensitive to atmospheric carbon dioxide concentration than indicated by past reports. As usual and expected, carbon dioxide emissions set a record again in 2013, the fifth-warming year on record and the second-warmest year without an El Nino. Another El Niño is on the way, as pointed out by Robert Scribbler on 6 March 2014: “Should the predicted El Nino emerge and be as strong as average model values indicate, global surface temperatures could rise by between .05 and .15 degrees Celsius …. This would be a substantial jump for a single year, resulting in yet one more large shift toward an ever more extreme climate.” Indeed, the upper end of the projected range takes us to 1 C warmer than baseline. On the topic of tipping points, we crossed the Rubicon in 2007 at about 0.76 C warming. At this point, according to David Spratt’s excellent September 2013 report, “Is Climate Already Dangerous?”, not only had Arctic sea-ice passed its tipping point, but the Greenland Ice Sheet was not far behind, as the Arctic moves to sea-ice-free conditions in summer (the U.S. Navy predicts an ice-free Arctic by summer 2016, a year later than expected by the United Kingdom Parliament, which points out that the six lowest September ice extents have occurred in the last six years, 2006-2012, and now we can add 2013 and 2014 to the list). Glaciologist Jason Box, an expert on Greenland ice, agrees. 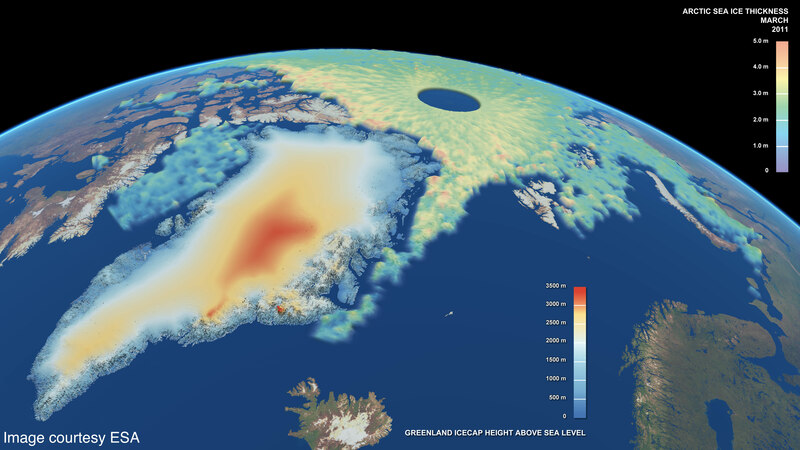 Box was quoted in a 5 December 2012 article in the Guardian: “In 2012 Greenland crossed a threshold where for the first time we saw complete surface melting at the highest elevations in what we used to call the dry snow zone. … As Greenland crosses the threshold and starts really melting in the upper elevations it really won’t recover from that unless the climate cools significantly for an extended period of time which doesn’t seem very likely.” (In January 2013, Box concluded we’ve locked in 69 feet — 21 meters — of sea-level rise.) Indeed, as stated that same year in the September issue of Global Policy, “because of increasing temperatures due to GHG emissions a suite of amplifying feedback mechanisms, such as massive methane leaks from the sub-sea Arctic Ocean, have engaged and are probably unstoppable.” By December 2013, the disappearance of Greenland’s ice had accelerated to five times the pace of a few years previously, and IPCC was acknowledging they’d been far too conservative with past estimates. Continued conservatism is buttressed by research reported in the 16 March 2014 issue of Nature Climate Change indicating melting of Greenland ice accounts for about one-sixth of recent sea-level rise and also by research published in the 18 May 2014 issue of Nature Geoscience indicating Greenland’s icy reaches are far more vulnerable to warm ocean waters from climate change than had been thought. Finally, a research paper published in the 13 June 2014 of Geophysical Research Letters points out that an ice-free Arctic is likely to cause rapid melting of Greenland ice. as reported in the 13 August 2014 issue of Nature. If you think we’ll adapt, think again, even if you’re the Wall Street Journal claiming on 2 September 2014 that it’s too late for mitigation. The rate of evolution trails the rate of climate change by a factor of 10,000, according to a paper in the August 2013 issue of Ecology Letters. Even once-rich habitats in Antarctica are becoming biologically impoverished as icebergs, increasingly breaking free from the surrounding sea ice, scour the shallow-water rocks and boulders on which a diversity of creatures cling to life(according to research published in the 16 June 2014 issue of Current Biology). And it’s not as if extinction events haven’t happened on this planet, as explained in the BBC program, The Day the Earth Nearly Died. The rate of climate change clearly has gone beyond linear, as indicated by the presence of the myriad self-reinforcing feedback loops described below, and now threatens our species with extinction in the near term. As Australian biologist Frank Fenner said in June 2010: “We’re going to become extinct,” the eminent scientist says. “Whatever we do now is too late.” Anthropologist Louise Leakey ponders our near-term demise in her 5 July 2013 assessment at Huffington Post and her father Richard joins the fray in thisvideo from December 2013 (see particularly 1:02:18 – 1:02:56). Canadian wildlife biologist Neil Dawe joins the party of near-term extinction in an interview 29 August 2013 and musician-turned-activist Sir Bob Geldof joins the club in a Daily Star article from 6 October 2013. Health officials add their voices to the discussion about extinction in late March 2014, although they view 4 C as a problem to be dealt with later. Writing for Truth-Out, journalist John Feffer writes in his 27 April 2014 essay: “The planet and its hardier denizens may soldier on, but for us it will be game over.” American linguist and philosopher Noam Chomsky concludes we’re done in a 15 June 2014 interview with Chris Hedges at Truthdig, saying climate change “may doom us all, and not in the distant future.” Larry Schwartz, writing for AlterNet on 21 July 2014, concludes, “Many environmentalists think we have already passed the point of no return.” Johns Hopkins professor and fossil hunter Ken Rose agrees in an interview published 29 July 2014: “We’re in the middle of the sixth great extinction on Earth. It probably won’t take too long for humans to go extinct.” IT Project Manager Jennifer Hynes concludes near-term human extinction certain at the 1:20:30 mark of this comprehensive presentation about global methane release. Three weeks later, Robert Scribbler concludes in his assessment of global methane release, “What I’ve just described is the process that most scientists believe occurred during the worst mass extinction event in the geological past … what humans are now doing … may well be shockingly similar.” In the face of near-term human extinction, most Americans view the threat as distant and irrelevant, as illustrated by a 22 April 2013 article in the Washington Post based on poll results that echo the long-held sentiment that elected officials should be focused on the industrial economy, not far-away minor nuisances such as climate change. Supporters of carbon farming — the nonsensical notion that industrial civilization can be used to overcome a predicament created by industrial civilization — claim all we need to do is fill the desert with nonnative plants to the tune of an area three-quarters the size of the United States. And, they say, we’ll be able to lower atmospheric carbon dioxide by a whopping 17.5 ppm in only two decades. Well, how exciting. At that blistering pace, atmospheric carbon dioxide will be all the way back down to the reasonably safe level of 280 ppm in only 140 years, more than a century after humans are likely to become extinct from climate change. And, based on research published in the 2 May 2014 issue ofScience, soil carbon storage has been over-estimated and is reduced as atmospheric carbon dioxide concentration rises.